Today John shows off control arms for your 1955-1957 Classic Chevy. A great way to keep your steering in tact! Finally! The wait for a stock look upper control arm with positive caster built in is over! 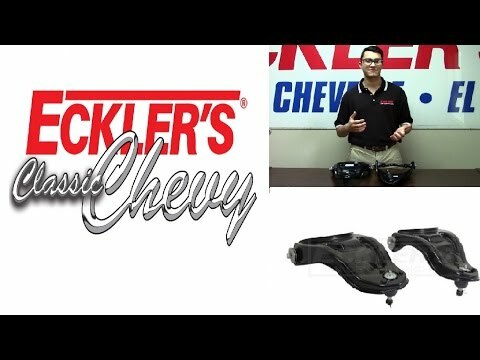 Eckler’s Classic Chevy brings you a heavy, stamped steel upper A-arm with the ball joint moved to net you 5 degrees of positive caster in your 1955, 1956 or 1957 Chevrolet Bel Air, 150, 210, Nomad or wagon. Why do you need this extra caster? This caster setting lets the steering wheel return to center after turning which is especially useful on power steering conversion cars. Trust Ecklers Classic Chevy for all your restoration parts needs always at the best possible price. way to keep your steering in tact!